Fall vocabulary list, words and pictures - 32 words. ​F is for fall - trace and color printable. ​Fall theme color by number printables - 3 pages. ​Leaves trace and color booklet to make. 9 reader pages. 8 different leaves. Fill the fall leaves themed 10-frames with manipulatives such as pom poms, counters or play dough. 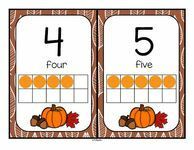 Fall theme tracing and counting printables - 3 pages. ​Fall order by size pictures, plus graphic organizer mat. Fall alphabet letters flashcards - use to make games and for room decor. ​Fall theme sight words, predictable "reading"- cut and paste to complete 12 sentences. ​Fall theme coloring printable - harvest vegetables. ​Fall theme coloring printable - pumpkin vines. Set of fall ten-frames posters 0-20. They can also be used as large flashcards for small group lessons. ​Happy Autumn poster cut and paste mixed up letters. Fall bookmarks. Print on cardstock, cut out and decorate.